Maybe I do not play enough of the games of the hidden object/adventure genre, but it does seem to me that they become more and more demonic/satanic/paranormal-themed. 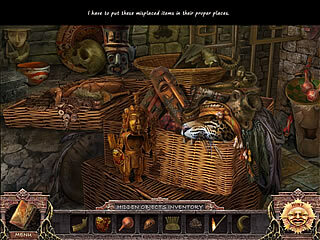 Secrets of the Dark: Temple of Night is one of those recently released. The dark world is easily reached by turning light into darkness. In this game, you are asked by a friend to go to a litterally demon possessed town. The legend has it that there used to be a temple of this dark god, but it all was long ago, and nobody believes it now. But according to your friend and his tapes and what you can see with your own eyes, the legend got it right. So, anyways, you start exploring the town for more clues to help your friend, who is now captured by the demons in their realm. Their world is easily reached by turning light into darkness. For this reason almost in every location there is a way to get rid of the light. Once a window is closed, for example, the whole place turnes into a different location of the demons world. That is a nice feature since now you don't just have to go back to get something, but also sometimes you have to turn the place to the other reality to get what you need. 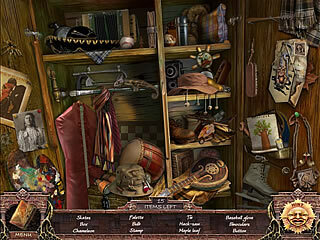 Then there are also hidden object levels, which go in all forms possible. You may have to put things to where they belong or you may have to find the things listed. Those levels are not too challenging. Most of the things are right before you. That may not sound too attractive for the more experienced gamers, but that gives more harmony to the scenes, because all the things actually belong. There are of course different mini-games all along the way. You will collect more and more information about the town and this dark god. The story itself is very dynamic as well as the music. It is not creepy calm as in most games of the genre. The game is good if you are looking for something fast paced, dark, and puzzling. This is Secrets of the Dark: Temple of Night review. Download this game here.